We are Coast Guard approved. The training we offer is equal to what the professionals get! ONLINE.........100% ONLINE WITH EXTRA ONLINE HELP THEN TAKE A CG APPROVED TEST IF YOU WANT A LICENSE. Even better, you can start online with no commitment.. This charter boat Coast Guard captain's license course incorporates 55 years of nautical training and the newest way of learning with distance learning classes and quizs for your charter boat captains license. Many subjects may be taught using the "new age" methods online in the comfort of your home avoiding the expense and inconvenience of travel. 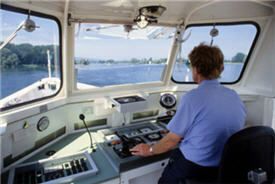 For some online is fine, Others are best taught in the classroom setting with a professional nautical teacher!